For many, having a truly great boss is the exception rather than the rule. That's because being one takes a seriously deft touch. You have to inspire people to succeed and give them the tools they need - all while meeting company dictates. Most of us assess how great a boss is by how he or she manages employees. But in order to manage employees really well, a leader actually needs to master two other things first, said Harvard Business School Professor Linda Hill, the coauthor of two leadership books, "Being the Boss" and "Collective Genius." One, Hill said, is to develop self-awareness, to know how others feel when they're with you. Are they scared of you? Do they trust you? Do they feel you trust them? "It's always about the emotional connection," she said. "Being scared around you doesn't lead to your being respected." The second is to successfully manage your network of colleagues and bosses over whom you have no authority but whose support you and your team will need to excel. Think about it this way: Even if your employees love you, they'll become very frustrated if you're powerless to sell their ideas up the food chain. 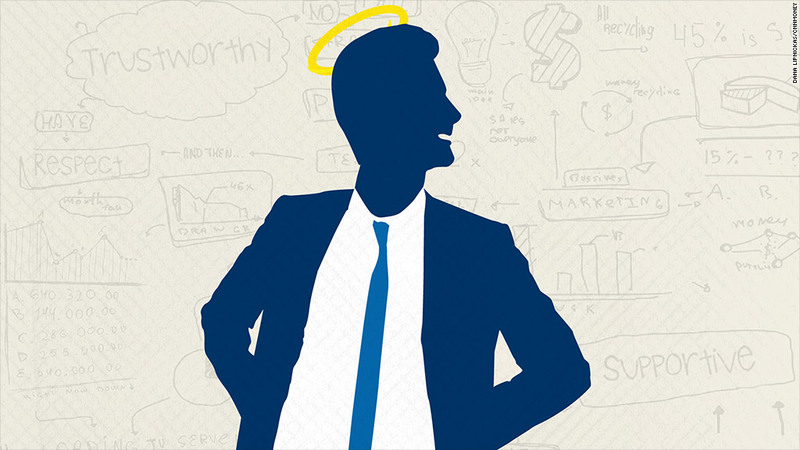 CNNMoney asked readers to weigh in on what they think characterizes the best bosses. Three traits came up again and again in their comments. They respect what you do, they respect your expertise and they respect the fact that you may have your own work style. "Great bosses earn respect by giving respect," said one reader. Bosses who say "thank you" came up a lot, too, as did bosses who publicly give credit where it's due, who welcome employees' input and feedback, and who recognize that employees are humans, not just "resources," as another reader put it. An excellent boss trusts you to do your job, has faith in your team, encourages your success, goes to bat for you and is always approachable. "I would gladly follow [a wonderful boss] to another company if they left because working for them is a great experience. And you want to take on new challenges and risk because you know they have your back," said Colin Adams of Somerville, Mass. Great bosses are also consistently ethical and fair, and they hire good people, readers said. A great boss provides clear guidance, coaching and structure but also the leeway to develop a sense ownership over your work. And when something goes wrong, readers said, great bosses assess what happened and help you fix the situation rather than assign blame. "[They'll] allow you to make mistakes and learn from those mistakes without throwing you under the bus," said Jim Langseth of Minnetrista, Minn. Indeed, in her research, Hill found that people consistently said their best bosses were demanding but also extremely generous in terms of giving them the space to show their talents and giving them the benefit of the doubt when something goes wrong.